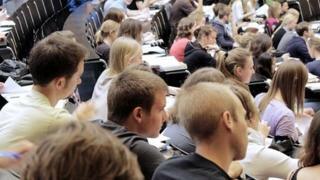 There are warnings that a lack of higher education in some parts of England could hamper the growth of local economies. Maps produced by the Higher Education Funding Council for England (Hefce) reveal "cold spots" in degree places and entry rates into university. These include parts of south-west England and East Anglia. Hefce chief Madeleine Atkins says universities play a "critical role" in creating a skilled workforce. The mapping by the funding council shows big regional differences in the provision of higher education and how many young people take up university places. Limits on student numbers are to be lifted in England from next year - with the number of undergraduate places expected to increase by about 20%. The funding council map shows the concentration of higher education places in and around London, and then a corridor of "hot spots" through the midlands and up towards the north west. But the availability of places is much more stretched in areas in the east of England, the south west, north east and Cumbria. There is also a "cold spot" along the border between England and Wales. Prof Atkins says universities play a key role as drivers of local economies - and the funding council research shows a link between higher graduate numbers and lower levels of unemployment. The longest average distances travelled by students from their home to get a university place are those from the south west. The shortest distance travelled was for young people from London - with many options for studying in the capital. Young people in London were also the most likely to stay near their family home after graduation. The mapping shows that university take-up is not simply about the proximity of universities. There is a much higher likelihood of young people entering university in the Liverpool area than in Birmingham, when looking at young people with similar exam grades. There are also local "subject deserts", with some particular subjects not available, even if there is a university in the area. "The data shows us that the issues associated with higher education cold spots can often be complex," says Prof Atkins. The funding council maps also show the proportion of young people entering higher education - and this highlights areas with a particularly low level of graduates, including coastal regions, the east and north-east of England. It also shows how neighbouring areas can have very different levels of going to university. London has high levels of university entry, even in poorer parts of the capital. But travelling eastwards from London along the Thames, there are parts of Dartford and Thurrock with some of the lowest levels of university participation in the country. Anna Vignoles, professor of education at Cambridge University, said that whether someone lived near a university did not affect whether or not they would enter higher education. But distance was a "significant influence" on which university young people attended. "The geographical spread of universities will therefore influence the types of university that some students are likely to enrol in," said Prof Vignoles. Helen Simpson, reader in economics at the University of Bristol, said there was evidence that "for some students distance will matter, so the range of higher education institutions available to them locally can affect the type of institution they ultimately study at". Alison Wolf, professor of public sector management at King's College London said: "Pouring public money into a locality obviously creates direct local beneficiaries. But there is nothing in the research literature to suggest it automatically strengthens the wider local economy in the short or the long term. "And if economic growth is what you are after, there is nothing to suggest that building yet more new universities is the most effective use for public money."